You want your guitar playing to sound awesome no matter what you play, right? Of course you do - everyone wants this! Here is a secret that most guitar players do not know about: learning more guitar licks, exotic scales or flashy techniques won’t do much to make your guitar playing sound great. What you really need is to learn how to add fire and emotion to every guitar lick you already know. This isn’t hard to do, and you are about to learn how to do it. How to take all guitar licks you already know and make them sound so awesome, you will hardly believe it’s you playing them! 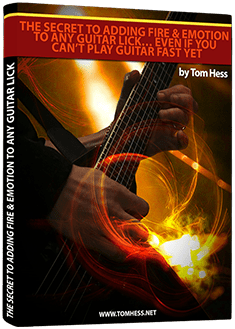 To learn (for free) the secret to playing guitar licks with fire and emotion, enter your name and email, and click the 'Give Me Access Now' button. All information is kept 100% private and confidential.